Historical Note: There are about 20 tombstones in the Eureka Valley Cemetery. Earliest stone is for Mary Evaline Warner, born 3 September 1844 and died 8 September 1857. Most recent burial was in 1927. Directions: From Manhattan, take KS-K18 (Ft Riley Blvd) to Skyway Dr exit. At the traffic circle, take the 2nd exit onto Skyway Dr for .3 mile. Turn right on Eureka Dr for 1.3 mile. Turn right. 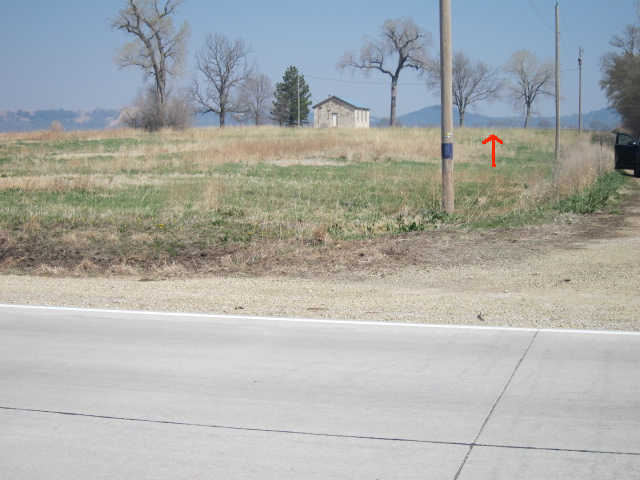 Watch for a small rock building standing alone in a field. The cemetery is just beyond this building. A narrow dirt road leads to the cemetery. There are no signs for this cemetery. Refer to the picture at the right.